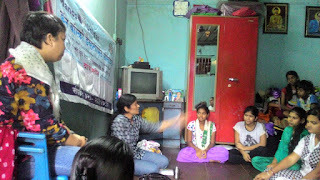 Pune, 11-August-2017: The Don Bosco Development Society (DBDS) organized an interactive session on ‘Physiological Changes And Socio-Psychological Life Of Adolescents’ for the adolescent girls residing in the Sidharthnagar and Ramwadi slums in Pune. The workshop was held under the aegis of ‘Women Empowerment Project’ supported by Manos Unidas, Spain. The event was held in association with Alochana Sanstha (NGO). The objective of this workshop was to create awareness on the physiological and psychological changes taking place during the adolescent age group in girls. 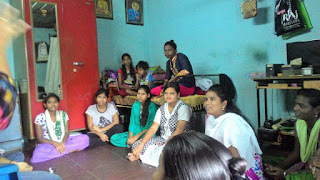 Mrs. Devika and Mrs Archana were the resource persons who spoke on the physical and mental changes, health, hygiene and social aspect of adolescent period. They also covered topics on vulnerability to risky situation like sexually transmitted diseases, sexual abuse, HIV/AIDS and drug and substance abuse. 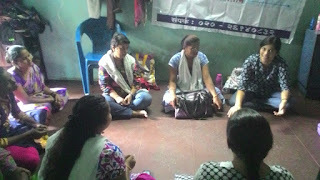 Adolescent girls and their parents participated in this program and discussed their problems. 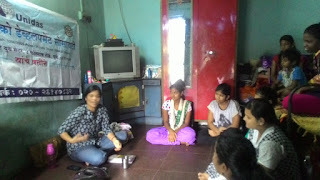 Adolescent girls openly asked their personal problems and requested DBDS to take more of this kind of sessions even for other girls in the slum.